Description: Venus Record's 180-gram LP Collection! Newly recorded jazz albums by today's top artists on vinyl! Audiophile quality, limited edition pressed to perfection in Japan! Danish native Jacob Fischer is a rising star and one of the most in-demand jazz guitarists in Europe. Born in 1967, the self-taught guitarist began working as a professional when he was 17 years old, and since then has participated in over 200 recordings. Fischer impressed us with his debut from the Japanese label Venus Records, a Bill Evans tribute album with a simple trio with bass and drums. 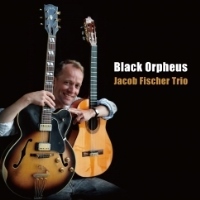 Now, he has shown a completely different side with his second release Black Orpheus, playing Brazilian music (bossa nova, samba and choro) with acoustic guitar. His authentic feel comes from his experience of traveling and performing throughout Brazil, and support of the great Brazilian drummer Duduka DaFonseca. Fantasitic! Produced by Tetsuo Hara. Recorded at Trading 8s Studio in New York on June 22 and 23, 2013. Engineered by Katherine Miller. Mixed and mastered by Tetsuo Hara.